Objective To do a systematic review and meta-analysis of studies comparing sequential therapy for eradication of Helicobacter pylori with pre-existing and new therapies, thus providing a glimpse of eradication success worldwide. Data sources Medline, Embase, and Cochrane Central Register of Controlled Trials up to May 2013; abstract books of major European, American, and Asian gastroenterological meetings. Study selection Randomised controlled trials in previously untreated adults, in which sequential therapy was compared with a pre-existing or new therapy. Results 46 randomised controlled trials were reviewed and analysed. 5666 patients were randomised to sequential therapy and 7866 to other (established and new) treatments. The overall eradication rate of sequential therapy was 84.3% (95% confidence interval 82.1% to 86.4%). 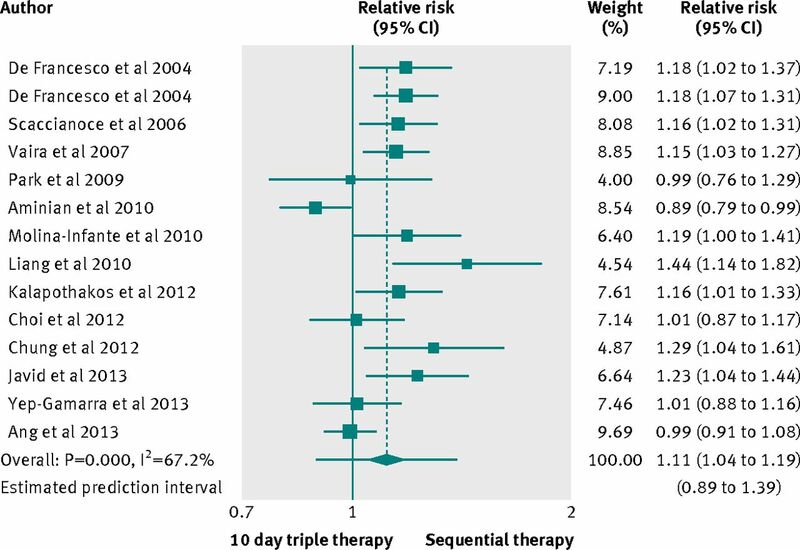 Sequential therapy was superior to seven day triple therapy (relative risk 1.21, 95% confidence interval 1.17 to 1.25; I2=29.3%; number needed to treat 6 , 95% confidence interval 5% to 7%), marginally superior to 10 day triple therapy (1.11, 1.04 to 1.19; I2= 67.2%; NNT 10, 7 to 15), but not superior to 14 day triple therapy (1.00, 0.94 to 1.06; I2=54.3%), bismuth based therapy (1.01, 0.95 to 1.06; I2=21.1%), and non-bismuth based therapy (0.99, 0.94 to 1.05; I2=52.3%). Data on eradication according to pre-treatment antimicrobial susceptibility testing were available in eight studies, and sequential therapy was able to eradicate 72.8% (61.6% to 82.8%) of the strains resistant to clarithromycin. Conclusions Eradication rates with pre-existing and new therapies for H pylori are suboptimal. Regional monitoring of resistance rates should help to guide treatment, and new agents for treatment need to be developed. Helicobacter pylori infection causes peptic ulcers, gastric mucosa associated lymphoid tissue lymphoma, and gastric cancer.1 Standard treatments for H pylori infection that have been endorsed by US as well as European scientific societies and by regulatory authorities rely on clarithromycin, metronidazole, or amoxicillin in conjunction with gastric acid inhibitors.2 3 The prevalence of resistance to clarithromycin and metronidazole has increased substantially in recent years, and a corresponding decrease has occurred in the eradication rate for H pylori infection,4 which has declined to unacceptable levels in most Western countries.5 A new treatment regimen that would achieve the eradication rates of 90% or greater seen at the advent of H pylori treatment is urgently needed.5 Such a regimen would need to have high efficacy against clarithromycin resistant and metronidazole resistant strains of H pylori, as these strains are increasingly encountered in routine clinical practice. As the response to eradication therapy is significantly related to the prevalence of primary resistance in the population, the choice of a treatment regimen should be based on the knowledge of the underlying prevalence of resistant strains in the community, which needs to be monitored. Recently, several randomised controlled trials have compared sequential therapy with other established and new therapies. These provide a glimpse into eradication rates for H pylori in the countries where those studies were conducted. The aim of this study was to assess the efficacy of sequential therapy compared with other eradication regimens, by doing a systematic review and meta-analysis of randomised controlled trials. This meta-analysis was developed according to the PRISMA (preferred reporting items for systematic reviews and meta-analyses) statement guidelines.8 We searched the medical literature by using Medline (1950 to May 2013), Embase (1980 to May 2013), and the Cochrane Central Register of Controlled Trials (May 2013). Randomised controlled trials examining the eradication rate of sequential therapy compared with other treatments were eligible for inclusion (box). We identified eligible studies with the terms “Helicobacter pylori”, “H. pylori”, “H pylori”, “Campylobacter pylori”, “C. pylori”, “C pylori”, “infection”, “dyspepsia”, “sequential”, “triple”, “concomitant”, “quadruple”, “treatment”, “therapy”, “omeprazole”, “lansoprazole”, “rabeprazole”, “pantoprazole”, “esomeprazole”, “bismuth”, “clarithromycin”, “metronidazole”, “tinidazole”, “amoxicillin”. We imposed no language restrictions. Two investigators (LG and NV) evaluated abstracts of the papers identified by the initial search for appropriateness, independently and in a blinded manner. Foreign language papers were translated where necessary. We also searched the abstract books from the British Society of Gastroenterology (2001-12), American Gastroenterological Association (2000-13), American College of Gastroenterology (2004-12), United European Gastroenterology Week (2000-12), European Helicobacter pylori Study Group (2000-12), and Asian Pacific Digestive Week (2003-12). We used bibliographies of all relevant studies identified to do a recursive search. In addition, we contacted authors to obtain unpublished data from their studies, whenever we deemed it necessary. The primary outcome was the efficacy of sequential therapy compared with established and new therapies in eradicating H pylori infection. Secondary outcomes included safety and efficacy according to the antimicrobial resistance pattern, where reported. Two investigators (LG and NV) assessed articles independently, using pre-designed data extraction forms. Disagreement between investigators was resolved by discussion with the other two investigators (DV and CS). Data on eradication were based on intention to treat analysis. In addition, the following clinical data were extracted for each trial: country of origin, type of publication (article, abstract), proton pump inhibitor used, use of tinidazole (versus other nitroimidazole derivatives), duration of comparative eradication treatment, and adverse event rate. We assessed risk of bias as described in the Cochrane handbook,9 by evaluating the random sequence generation, concealment of allocation, blinding of participants and personnel, blinding of outcome assessment, incomplete outcome data, selective reporting, and other sources of bias. We considered randomised controlled trials as being at low risk of bias if all the domains except blinding of participants or personnel were properly assured. As the outcome (that is, eradication) was almost always assessed by objective means, we did not consider blinding to be crucial. The search strategy we used identified 610 citations, of which we excluded 545 after examining the title and abstract. We retrieved and evaluated 65 articles in more detail. Of these, we excluded 19 for various reasons, leaving 46 randomised controlled trials that were eligible for inclusion,6 7 15 16 17 18 19 20 21 22 23 24 25 26 27 28 29 30 31 32 33 34 35 36 37 38 39 40 41 42 43 44 45 46 47 48 49 50 51 52 53 54 55 56 57 58 as shown in figure 1⇓, 11 of which were abstracts.15 22 24 36 38 45 46 49 53 56 57 Fifteen studies included more than two arms.16 19 24 27 29 32 33 34 38 39 48 49 50 57 58 Three studies could not be included in the meta-analysis because our criteria required at least three comparable study groups for every comparison.32 47 54 Only four trials were at low risk of bias.7 32 51 55 The table⇓ shows detailed characteristics of the studies included in the systematic review and meta-analysis. Supplementary table A shows a complete evaluation of risk of bias. Fig 1 Flow diagram of systematic review. ITT=intention to treat; PP=per protocol. Twenty two studies compared sequential therapy with a triple therapy regimen lasting seven days.6 15 16 18 19 20 21 22 23 24 25 26 30 33 36 38 39 42 43 46 48 52 No trial was at low risk of bias, and two trials did not report full data on the proton pump inhibitor used.24 48 As shown in figure 2⇓, the pooled relative risk was 1.21 (95% confidence interval 1.17 to 1.25), favouring sequential treatment, the number needed to treat was 6 (95% confidence interval 5 to 7), and the 95% prediction intervals ranged from 1.10 to 1.33. We found evidence of heterogeneity (I2=29.3%; P=0.098), without funnel plot asymmetry (Egger’s test coefficient −0.69, 90% confidence interval −1.71 to 0.33; P=0.257). In all, 2449 patients were treated with the sequential therapy compared with 2566 patients treated with triple therapy lasting seven days, and the eradication rate reported was 86.5% (95% confidence interval 82.9% to 89.7%) for the sequential therapy and 71.5% (68.4% to 74.5%) for the triple therapy. The difference in eradication rates was 15% (13% to 18%) favouring sequential treatment, and the 95% prediction intervals ranged from 9% to 22% (supplementary figure A), with evidence of heterogeneity (I2=34.0%; P=0.061). Because of the heterogeneity, we did subgroup analyses according to country of origin, use of tinidazole in the sequential therapy, type of publication, and proton pump inhibitor used; we did not evaluate risk of bias, as all trials were at high or unclear risk of bias (supplementary table B). We found a slightly statistically significant effect in favour of sequential therapy in trials conducted in China, Italy, Korea, and Morocco. Data on adverse events were available in 18 trials.6 16 18 19 20 21 23 25 26 30 33 38 39 42 43 46 48 52 The pooled relative risk was 1.11 (0.97 to 1.27), indicating no significant difference, with no evidence of heterogeneity (I2=0%; P=0.918). Fourteen studies compared sequential therapy with a triple therapy regimen lasting 10 days.7 16 17 19 24 27 28 29 39 44 45 51 53 57 Only two trials were at low risk of bias,7 51 and three trials did not report full data on the proton pump inhibitor used.24 45 57 As shown in figure 3⇓, the pooled relative risk was 1.11 (1.04 to 1.19), slightly favouring sequential treatment, the 95% prediction intervals ranged from 0.89 to 1.39, and the number needed to treat was 10 (7 to 15). We found evidence of heterogeneity (I2=67.2%; P=0.000) but no funnel plot asymmetry (Egger’s test coefficient 2.35, −1.96 to 4.90; P=0.126). In all, 1368 patients were treated with the sequential therapy compared with 1378 patients treated with triple therapy lasting 10 days, and the eradication rate reported was 84.3% (79.8% to 88.4%) for the sequential therapy and 75.3% (69.6% to 77.9%) for the triple therapy lasting 10 days. The difference in eradication rates was 9.0% (4% to 14%), favouring sequential treatment, the 95% prediction intervals ranged from −9% to 26% (supplementary figure B), with evidence of heterogeneity (I2=66.4%; P=0.000). Because of the heterogeneity, we did subgroup analyses according to country of origin, use of tinidazole (instead of metronidazole) in the sequential therapy, risk of bias, type of publication, and proton pump inhibitor used (supplementary table C). 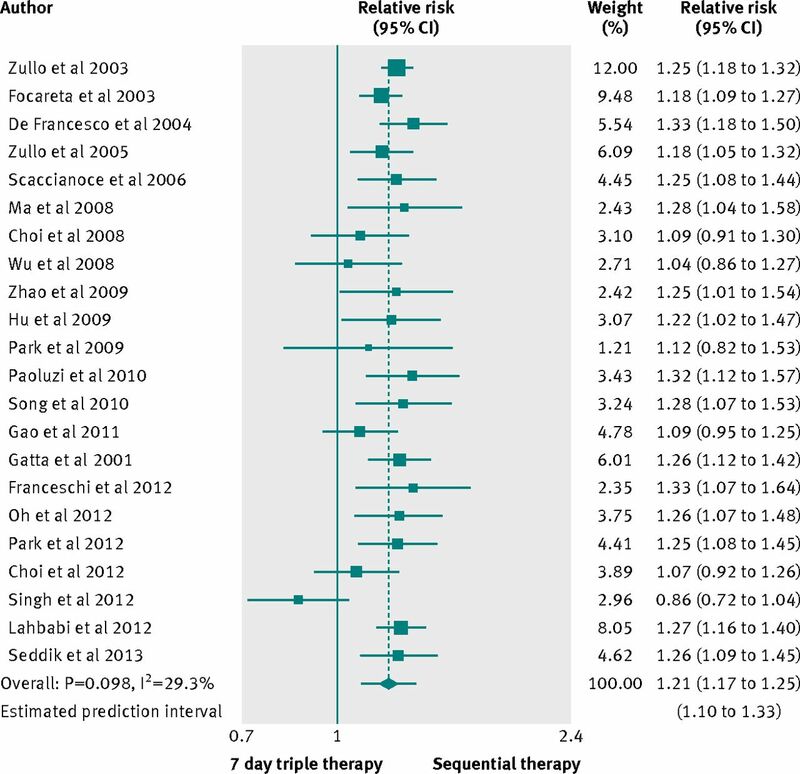 We found a slightly statistically significant effect in favour of sequential therapy in trials conducted in China, Greece, India, Italy, and Spain. Data on adverse events were available for 11 trials.7 16 19 27 28 29 39 44 45 51 53 The pooled relative risk was 0.94 (0.79 to 1.13), indicating no significant difference, with no evidence of heterogeneity (I2=0%; P=0.642). Seven studies compared sequential therapy with a triple therapy regimen lasting 14 days.24 34 35 37 39 49 50 No trial was at low risk of bias, and one trial did not report full data on the proton pump inhibitor used.24 As shown in figure 4⇓, the pooled relative risk was 1.00 (0.94 to 1.06), and the 95% prediction intervals ranged from 0.83 to 1.19. We found evidence of heterogeneity (I2=54.3%; P=0.010) but no funnel plot asymmetry (Egger’s test coefficient -1.564, −3.46 to 0.33; P=0.167). In all, 1224 patients were treated with the sequential therapy compared with 1227 patients treated with triple therapy lasting 14 days, and the eradication rate reported was 80.8% (76% to 85.1%) for the sequential therapy and 81.3% (79.5% to 84.7%) for the triple therapy. The difference in eradication rates was −0.5% (−5% to 5%), and the 95% prediction intervals ranged from −16% to 15% (supplementary figure C), with evidence of heterogeneity (I2=61.1%; P=0.003). Because of the heterogeneity, we did subgroup analyses according to country of origin, use of tinidazole in the sequential therapy, type of publication, and proton pump inhibitor used; we did not evaluate risk of bias, as all trials were at high or unclear risk of bias (supplementary table D). We found no statistically significant differences. Data on adverse events were available for four trials.35 37 39 50 The pooled relative risk was 0.98 (0.73 to 1.33), indicating no significant difference, with evidence of heterogeneity (I2=47.8%; P=0.125). The analysis of the studies comparing triple therapies of different durations with sequential therapy allowed us to evaluate the effect of length of the triple regimens on the eradication rate. We found a significant trend (χ2 for trend: P<0.001) between the duration of therapy and the success of treatment, even if the clinical gain was modest. Therapy lasting 14 days eradicated 9.8% (6.3% to 11.9%) and 6% (2.9% to 9.3%) more infections than therapy lasting seven and 10 days. We found no significant difference in eradication rate between therapy lasting seven and 10 days (3.8%, −0.1% to 5.8%). In three studies bismuth containing therapies lasted 14 days,27 40 49 whereas in two trials they had a 10 day duration.33 56 Different bismuth formulations were used, including colloid bismuth subcitrate, bismuth pectin, and other unspecified bismuth salts. In one of the studies lasting two weeks, furazolidone was given during the first week of treatment.40 No trial was at low risk of bias. The pooled relative risk was 1.01 (0.95 to 1.06) (fig 5⇓), and the 95% prediction intervals ranged from 0.89 to 1.14. We found evidence of low heterogeneity (I2=21.1%; P=0.280) and no evidence of funnel plot asymmetry (Egger’s test coefficient 2.32, −0.32 to 4.9; P=0.131). The eradication rate with bismuth containing therapies, compared with the efficacy of sequential therapy, was not affected by the duration (P=0.592). In all, 546 patients were treated with the sequential therapy compared with 545 patients treated with bismuth containing quadruple therapy, and the eradication rate reported was 86.2% (82.1% to 89.8%) for the sequential therapy and 84.9% (78.8% to 90.1%) for the bismuth containing quadruple therapy. The difference in eradication rates was 1.3% (−4% to 5%), and the 95% prediction intervals ranged from −11% to 12% (supplementary figure D), with low heterogeneity (I2=22.3%; P=0.272). Data on adverse events were available for four studies.27 33 40 56 The pooled relative risk was 1.08 (0.71 to 1.63), indicating no significant difference, with evidence of heterogeneity (I2=25.5%; P=0.258). The pooled relative risk was 0.99 (0.94 to 1.05) (fig 6⇓), and the 95% prediction intervals ranged from 0.85 to 1.16. We found evidence of heterogeneity (I2=52.3%; P=0.021) and no evidence of funnel plot asymmetry (Egger’s test coefficient 0.96, −0.72 to 2.65; P=0.324). In all, 1039 patients were treated with sequential therapy compared with 1031 patients treated with concomitant therapy, and the eradication rate reported was 81.7% (76.1% to 86.7%) for sequential therapy and 81.3% (74.9% to 87%) for the non-bismuth containing quadruple therapy. The difference in eradication rates was 0.4% (−4% to 4%), and the 95% prediction intervals ranged from −14% to 13% (supplementary figure E), with evidence of heterogeneity (I2=55.3%; P=0.014). Because of the heterogeneity, we did subgroup analyses according to country of origin, risk of bias, proton pump inhibitor used, duration of non-bismuth containing quadruple therapy, type of publication, and use of tinidazole in the sequential therapy (supplementary table E). We found a slightly statistically significant effect in favour of sequential therapy in trials conducted in Chile and Costa Rica. Data on adverse events were available for four studies.31 41 55 58 The pooled relative risk was 0.92 (0.77 to 1.10), indicating no significant difference, with evidence of heterogeneity (I2=33%; P=0.214). In the studies using levofloxacin 1000 mg daily, 240 patients were randomised to standard sequential therapy and 240 to the levofloxacin based sequential therapy. The overall eradication rates of sequential therapy and of levofloxacin based sequential therapy were 78.7% (73% to 83.7%) and 90% (85.4% to 93.4%), with a difference of −11.3% (−4.8% to −17.7%) in favour of modified sequential therapy. Adverse event rates were 24.4% (19.1% to 30.4%) with the standard sequential therapy and 24.3% (19.1% to 30.4%) with the levofloxacin based sequential therapy, with a non-significant difference of 0.1% (−7.8% to 7.6%). In the studies using levofloxacin 500 mg daily, 240 patients were randomised to standard sequential therapy and 241 to the levofloxacin based sequential therapy. The overall eradication rates of sequential therapy and levofloxacin based sequential therapy were 79.5% (73.9% to 84.4%) and 89.6% (85% to 93.1%), with a difference of −10.1% (−3.6% to −16.5%) in favour of modified sequential therapy. Adverse event rates were 14.3% (10.1% to 19.4%) with the standard sequential therapy and 13.8% (9.7% to 18.9%) with the levofloxacin based sequential therapy, with a non-significant difference of 0.5% (−6.8% to 5.9%). The eradication rates of the modified sequential therapy using 1000 mg and 500 mg daily of levofloxacin were not significant different (difference 0.4%, −5.1% to 5.9%). Only two studies compared sequential therapy lasting 10 days with sequential therapy lasting 14 days.49 50 In all, 340 patients were randomised to the 10 day therapy and 340 to the 14 day therapy. The overall eradication rates of 10 and 14 day sequential therapy were 87.6% (83.6% to 90.9%) and 89.7% (85.9% to 92.7%), with a non-significant difference of −2.1% (−6.9% to 2.7%). Adverse events were reported in one study only,50 and no significant difference was seen between treatments (difference 5.5%, −13.5% to 2.5%). Hybrid therapy is an evolution of sequential therapy that uses a proton pump inhibitor twice daily and amoxicillin 1 g twice daily for 14 days plus 500 mg clarithromycin and nitroimidazole derivatives, both twice daily, for the last seven days. Two randomised controlled trials compared sequential therapy with hybrid therapy: 300 patients were randomised to each treatment.54 58 The eradication rate was 81% (76% to 85.2%) for the sequential therapy and 86.6% (82.2% to 90%) for the hybrid therapy, with no significant difference (−5.6%, −11.6% to 0.2%). Adverse event rates were 23% (18.3% to 28.1%) for the sequential therapy and 27% (22% to 32.2%) for the hybrid therapy, with no significant difference between the two therapies (−4%, −10.9% to 2.9%). Eight studies provided data on eradication according to pre-treatment antimicrobial susceptibility testing.6 7 31 32 36 41 44 50 Two studies were at low risk of bias.7 32 However, the number of patients with antimicrobial susceptibility testing was small and the 95% confidence intervals for eradication rates were wide, so caution is necessary in interpreting the following results. The overall eradication rate of sequential therapy in patients harbouring strains resistant to clarithromycin was 72.8% (61.6% to 82.8%). In patients harbouring strains resistant to clarithromycin, sequential therapy achieved a significantly higher eradication rate than did triple therapy lasting seven (difference in eradication rate 49.6%, 27.7% to 66.9%) and 10 days (49.8%, 20.3% to 70.5%). However, compared with triple therapy lasting 14 days, non-bismuth containing quadruple therapy, or sequential therapy in which levofloxacin was used instead of clarithromycin, no significant difference was seen (supplementary table F). The overall eradication rate of sequential therapy in patients harbouring strains resistant to metronidazole was 86.4% (78% to 93%). In patients harbouring strains resistant to metronidazole, sequential therapy achieved a significantly higher eradication rate than did triple therapy lasting seven (difference in eradication rate 24.1%, 7.2% to 41.3%) and 10 days (17%, 2.1% to 32.7%). Triple therapy lasting 14 days achieved a slightly higher eradication than sequential therapy (difference in eradication rate 16.4%, 0.14% to 32.8%). However, when we compared sequential therapy with non-bismuth containing quadruple therapy or sequential therapy in which levofloxacin was used instead of clarithromycin, we found no significant difference (supplementary table G). The overall eradication rate of sequential therapy in patients harbouring strains resistant to both clarithromycin and metronidazole was just 37% (16.2% to 60.7%). Only sequential therapy in which levofloxacin was used instead of clarithromycin was able to overcome the resistance to both antimicrobials (supplementary table H). Only one study tested primary resistance to levofloxacin.32 No significant difference in eradication rate was found between the sequential therapy and the “modified” sequential therapy (in which levofloxacin was used instead of clarithromycin), but the number of patients studied was extremely low (supplementary table I). In the 46 randomised controlled trials, 5666 patients were randomised to receive sequential treatment, and the overall eradication rate, pooled with a random model, was 84.3% (82.1% to 86.4%). Supplementary figure F shows the eradication rates of sequential treatment according to the country of origin. The results of this meta-analysis clearly show that, for eradication of Helicobacter pylori infection, sequential therapy is superior to seven day triple therapy and similar to regimens of longer duration and those including more than two antimicrobial agents. H pylori infection has been shown to cause peptic ulcer disease, gastric mucosa associated lymphoid tissue lymphoma, and gastric cancer.1 A recent study estimated that the number of new cases of gastric cancer (non-cardia gastric carcinoma and gastric mucosa associated lymphoid tissue lymphoma) attributable to H pylori infection in 2008 was 470 000 in less developed regions and 190 000 in the more developed regions of the world.59 Eradication therapy has been shown to improve outcomes in peptic ulcer disease as well as mucosa associated lymphoid tissue lymphoma, by reducing recurrence.5 Given the importance of eradicating H pylori infection in patients with ulcer disease, the infection should be treated optimally with a combination regimen that has an acceptably high eradication rate. Investigators in different parts of the world have made several attempts to find new regimens as a more effective alternative to traditional triple therapies. One of these is sequential therapy.68 Analysis of the first studies showed promising results, with eradication rates consistently higher than 90%.69 70 However, the number of studies was small and most of them were done in Italy. Since then, several randomised controlled trials have been carried out in different parts of the world comparing sequential therapy with traditional and novel treatments, providing a glimpse into current eradication rates with new and old treatments. Our results show that sequential therapy is clearly superior to the triple therapy regimen administered for seven days. But when a comparison was made with triple therapy lasting 10 days, the results were less clear-cut. Although the estimate of the effect size was better for the sequential therapy, prediction intervals were not significant, suggesting that future trials may not be able to observe a superior effect. When the comparison was made with triple therapy lasting 14 days and with bismuth based and non-bismuth based quadruple therapies, the sequential regimen was not significantly superior to any of these treatments. Pre-treatment susceptibility data were also available in eight studies.6 7 31 32 36 41 44 50 Previous data suggested a high eradication rate with sequential therapy in strains resistant to clarithromycin.6 7 Our data show that sequential therapy was able to eradicate 72.8% of strains resistant to clarithromycin. In the head to head comparisons, sequential therapy achieved significantly better results only when compared with triple therapy lasting seven or 10 days; we found no significant differences in other comparisons. For the strains resistant to metronidazole, the pooled eradication rate was 86.4%; however, as in the previous case, sequential therapy achieved significantly better results only when compared with triple therapy lasting seven or 10 days. For the strains resistant to both clarithromycin and metronidazole, only sequential therapy in which levofloxacin was used instead of clarithromycin was able to significantly overcome the resistance to both antimicrobials. Data on resistance and eradication should, however, be interpreted with caution owing to the small number of patients included in the trials. One of the studies included in our meta-analysis was a multicentre trial conducted in several South American countries.34 We decided to pool eradication data separately for each country. As recently shown,76 a significant dispersion can be seen across the countries, highlighted by the values of I2. Part of this dispersion could possibly be due to the differing prevalence of resistant organisms in the individual countries. The analysis by country shows that in Colombia, Mexico, and Nicaragua, no significant difference existed between treatments tested. 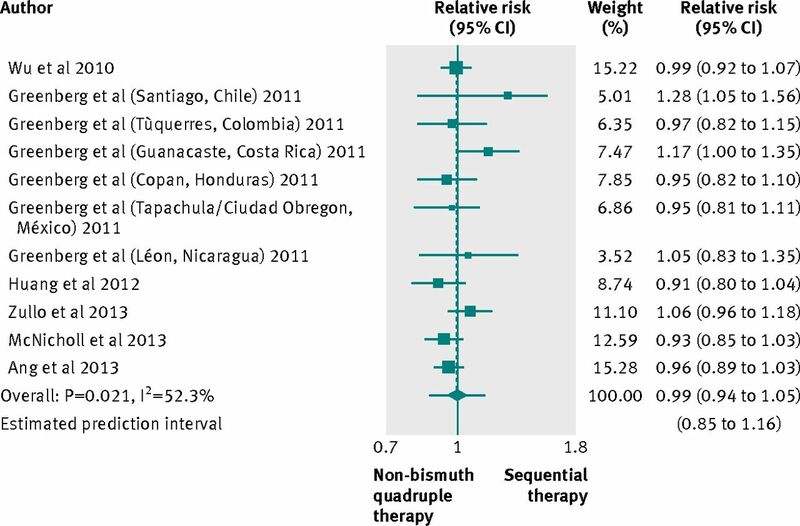 In the other three countries, the results were different: in Chile, the non-bismuth based quadruple therapy was inferior to the triple therapy lasting 14 days and to sequential therapy; in Costa Rica, sequential therapy was superior to the non-bismuth based quadruple therapy; and in Honduras, triple therapy lasting 14 days was superior to sequential therapy. When considering the results of this meta-analysis, some limitations should be acknowledged. As with any systematic review and meta-analysis, the results rely on the quality and reporting of the trials. Most of the studies included had problems with concealment of allocation and blinding, which are important safeguards against bias in randomised controlled trials.77 Allocation concealment seeks to prevent selection bias by concealing what treatment the next patient will receive before and until assignment.77 78 In contrast, blinding seeks to prevent performance and detection bias by protecting the sequence after assignment.77 79 Empirical studies show that the effects of experimental interventions measured as odds ratios are exaggerated on average by 21% if allocation concealment is unclear or inadequate and by 18% if trials are not reported as “double blind.”78 80 81 82 83 We also found significant heterogeneity, and subgroup analyses failed to identify plausible explanations. Subgroup analyses are entirely observational in their nature and have the limitations of any observational investigation, including possible bias through confounding by other study level characteristics.9 Therefore, the presence of heterogeneity without plausible explanations, as well as the presence of only a few trials at low risk of bias, affects the quality and the strength of the evidence.84 The applicability of the results should also be viewed with caution, as information regarding the efficacy of the sequential therapy in several Western countries is lacking. No studies have been reported from Canada, and few southern European countries are represented. One open label, randomised controlled trial is ongoing in the United States, comparing triple therapy containing clarithromycin and lasting 10 days with sequential therapy.85 Finally, data on the response of treatments according to pre-treatment sensitivity was available in a minority of the overall patients studied, not allowing a thorough analysis of the results. Sequential therapy is superior to seven day triple therapy and similar to regimens of longer duration or including more than two antimicrobial agents. The search for a new agent to treat H pylori is important and should continue, but until such an agent is discovered, any single therapy is unlikely to be effective all over the world. We are grateful to the following investigators for providing information from their studies: F Franceschi (Rome, Italy), E R Greenberg (Seattle, USA), J Molina-Infante (Caceres, Spain), J M Liou (Taipei, Taiwan), J W Chung (Incheon, Korea), M Singh (Sabah, Malaysia), H Sardarian (Sari, Iran), P N Kalapothakos (Sparti, Greece), M Lahbabi (Fez, Morocco), K Liu (Hong Kong, China), T L Ang (Singapore), A Zullo (Rome, Italy), V Yep-Gamarra (Trujillo, Peru). Contributors: LG, CS, NV, and DV conceived the study. LG, CS, and DV collected the data. LG and CS analysed and interpreted the data and drafted the manuscript. All authors commented on the drafts and approved the final draft. LG is the guarantor. Competing interests: All authors have completed the ICMJE uniform disclosure form at www.icmje.org/coi_disclosure.pdf (available on request from the corresponding author) and declare: no support from any organisation for the submitted work; CS has received consulting fees for advisory committees or review panels from Pfizer, Janssen-Cilag, and Sidem and for speaking and teaching from AstraZeneca; NV has received consulting fees for speaking and teaching from AstraZeneca, Takeda, Ironwood, and Otsuka and has ownership interest (stock shareholder) in Meridian Diagnostics and Orexo; no other relationships or activities that could appear to have influenced the submitted work. McColl KE. Clinical practice: Helicobacter pylori infection. N Engl J Med2010;362:1597-604. Malfertheiner P, Megraud F, O’Morain CA, Atherton J, Axon AT, Bazzoli F, et al. Management of Helicobacter pylori infection-the Maastricht IV/ Florence consensus report. Gut2012;61:646-64. Chey WD, Wong BC. American College of Gastroenterology guideline on the management of Helicobacter pylori infection. Am J Gastroenterol2007;102:1808-25. Megraud F, Coenen S, Versporten A, Kist M, Lopez-Brea M, Hirschl AM, et al. Helicobacter pylori resistance to antibiotics in Europe and its relationship to antibiotic consumption. Gut2013;62:34-42. Vakil N. Helicobacter pylori treatment: a practical approach. Am J Gastroenterol2006;101:497-9. Zullo A, Vaira D, Vakil N, Hassan C, Gatta L, Ricci C, et al. High eradication rates of Helicobacter pylori with a new sequential treatment. Aliment Pharmacol Ther2003;17:719-26. Vaira D, Zullo A, Vakil N, Gatta L, Ricci C, Perna F, et al Sequential therapy versus standard triple-drug therapy for Helicobacter pylori eradication: a randomized trial. Ann Intern Med2007;146:556-63. Higgins JPT, Green S (eds). Cochrane handbook for systematic reviews of interventions version 5.1.0 [updated March 2011]. Cochrane Collaboration, 2011 (available from www.cochrane-handbook.org). DerSimonian R. Meta-analysis in the design and monitoring of clinical trials. Stat Med1996;15:1237-48. Higgins JP, Thompson SG, Spiegelhalter DJ. A re-evaluation of random-effects meta-analysis. J R Stat Soc Ser A Stat Soc2009;172:137-59. Graham PL, Moran JL. Robust meta-analytic conclusions mandate the provision of prediction intervals in meta-analysis summaries. J Clin Epidemiol2012;65:503-10. Focareta R, Forte G, Forte F, Ciarleglio A, Grimaldi E, Ievoli F, et al. Could the 10 days sequrntial therapy be considered a first choice treatment for the eradication of Helicobacter pylori infection? Dig Liver Dis2003;35(suppl 5):S33. De Francesco V, Zullo A, Hassan C, Della VN, Pietrini L, et al. The prolongation of triple therapy for Helicobacter pylori does not allow reaching therapeutic outcome of sequential scheme: a prospective, randomised study. Dig Liver Dis2004;36:322-6. De Francesco V, Zullo A, Margiotta M, Marangi S, Burattini O, Berloco P, et al. Sequential treatment for Helicobacter pylori does not share the risk factors of triple therapy failure. Aliment Pharmacol Ther2004;19:407-14. Zullo A, Gatta L, De Francesco V, Hassan C, Ricci C, Bernabucci V, et al. High rate of Helicobacter pylori eradication with sequential therapy in elderly patients with peptic ulcer: a prospective controlled study. Aliment Pharmacol Ther2005;21:1419-24. Scaccianoce G, Hassan C, Panarese A, Piglionica D, Morini S, Zullo A. Helicobacter pylori eradication with either 7-day or 10-day triple therapies, and with a 10-day sequential regimen. Can J Gastroenterol2006;20:113-7. Choi WH, Park DI, Oh SJ, Baek YH, Hong CH, Hong EJ, et al. Effectiveness of 10 day-sequential therapy for Helicobacter pylori eradication in Korea. Korean J Gastroenterol2008;51:280-4. Ma CX, Peng GL, Zhao YK, Zhang XY, Zhan LY. Treatment outcomes of functional dyspepsia patients with Helicobacter pylori infection: a comparison between sequential treatment regimen and conventional triple therapy. Acad J Second Mil Med Univ2008;29:908-11. Wu HY, Hsi YT, Lam JTW, Lam WM. Ten-day sequential therapy as the first-line eradication of Helicobacter pylori infection in chinese patients: a randomized-controlled trial. Gut2008;57(suppl 2):A330. Hu SQ, Zhang M. A 10-day sequential therapy for Helicobacter pylori-infected patients: an analysis of 39 cases. World Chin J Dig2009;17:1693-5. Park S, Chun HJ, Kim ES, Park SC, Jung ES, Lee SD, et al. The 10-day sequential therapy for Helicobacter pylori eradication in Korea: less effective than expected. Gastroenterology2009;136:A339-40. Zhao QX, Huang DY. Efficacy of tinidazole-containing sequential therapy in the eradication of Helicobacter pylori infection. World Chin J Dig2009;17:3666-9. Paoluzi OA, Visconti E, Andrei F, Tosti C, Lionetti R, Grasso E, et al. Ten and eight-day sequential therapy in comparison to standard triple therapy for eradicating Helicobacter pylori infection: a randomized controlled study on efficacy and tolerability. J Clin Gastroenterol2010;44:261-6. Aminian K, Farsad F, Ghanbari A, Fakhreih S, Hasheminasab SM. A randomized trial comparing four Helicobacter pylori eradication regimens: standard triple therapy, ciprofloxacin based triple therapy, quadruple and sequential therapy. Trop Gastroenterol2010;31:303-7. Liang Z, Quan H, Xu G, Yu A. Follow-up study of 10-day sequential therapy on eradication of Helicobacter pylori. Chin J Gastroenterol2010;15:483-5. Molina-Infante J, Perez-Gallardo B, Fernandez-Bermejo M, Hernandez-Alonso M, Vinagre G, Duenas C, et al. Clinical trial: clarithromycin vs. levofloxacin in first-line triple and sequential regimens for Helicobacter pylori eradication. Aliment Pharmacol Ther2010;31:1077-84. Song Y, Huo H, Jiang X, Zhou J. Clinical study on effects of different eradication therapies for Helicobacter pylori on functional dyspepsia. Chin J Gastroenterol2010;15:240-2. Wu DC, Hsu PI, Wu JY, Opekun AR, Kuo CH, Wu IC, e al. Sequential and concomitant therapy with four drugs is equally effective for eradication of H pylori infection. Clin Gastroenterol Hepatol2010;8:36-41. Romano M, Cuomo A, Gravina AG, Miranda A, Iovene MR, Tiso A, et al. Empirical levofloxacin-containing versus clarithromycin-containing sequential therapy for Helicobacter pylori eradication: a randomised trial. Gut2010;59:1465-70. Gao XZ, Qiao XL, Song WC, Wang XF, Liu F. Standard triple, bismuth pectin quadruple and sequential therapies for Helicobacter pylori eradication. World J Gastroenterol2010;16:4357-62. Greenberg ER, Anderson GL, Morgan DR, Torres J, Chey WD, Bravo LE, et al. 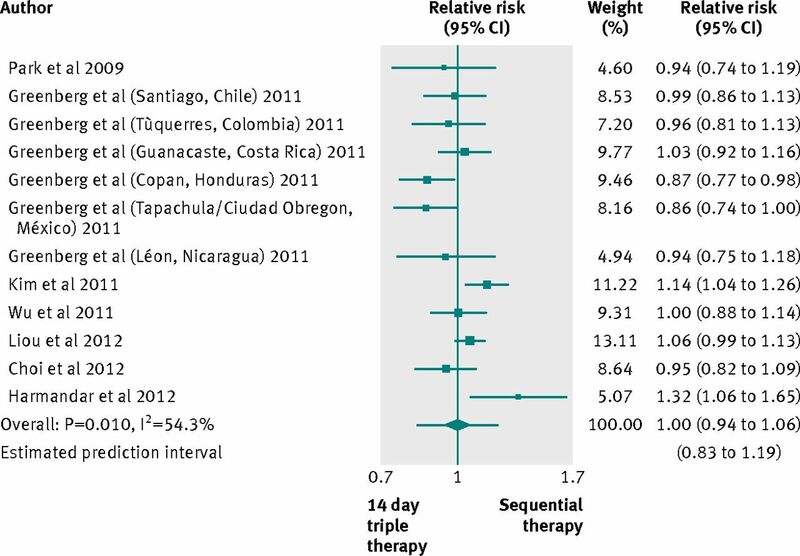 14-day triple, 5-day concomitant, and 10-day sequential therapies for Helicobacter pylori infection in seven Latin American sites: a randomised trial. Lancet2011;378:507-14. Kim YS, Kim SJ, Yoon JH, Suk KT, Kim JB, Kim DJ, et al. Randomised clinical trial: the efficacy of a 10-day sequential therapy vs. a 14-day standard proton pump inhibitor-based triple therapy for Helicobacter pylori in Korea. Aliment Pharmacol Ther2011;34:1098-105. Gatta L, Vaira D, Vakil N, Ricci C, Fiorini G, Castelli V, et al. Sequential therapy vs. standard triple therapy lasting 7 days: results of a prospective study. Gastroenterology2011;140(suppl 1):S148. Wu GL, Lan Y, Zhang XJ. Sequential therapy versus standard triple therapy for Helicobacter pylori eradication. World Chin J Dig2011;19:3100-3. Franceschi F, Campanale M, Finizio R, Barbaro F, Tortora A, Gigante G, et al. High dose amoxicillin-based first line regimen compared to sequential therapy in the eradication of H. pylori infection. Gastroenterology2012;142:S487. Choi HS, Chun HJ, Park SH, Keum B, Seo YS, Kim YS, et al. Comparison of sequential and 7-, 10-, 14-d triple therapy for Helicobacter pylori infection. World J Gastroenterol2012;18:2377-82. Fakheri H, Taghvaei T, Hosseini V, Bari Z. A comparison between sequential therapy and a modified bismuth-based quadruple therapy for Helicobacter pylori eradication in Iran: a randomized clinical trial. Helicobacter2012;17:43-8. Huang YK, Wu MC, Wang SS, Kuo CH, Lee YC, Chang LL, et al. Lansoprazole-based sequential and concomitant therapy for the first-line Helicobacter pylori eradication. J Dig Dis2012;13:232-8. Oh HS, Lee DH, Seo JY, Cho YR, Kim N, Jeoung SH, et al. Ten-day sequential therapy is more effective than proton pump inhibitor-based therapy in Korea: a prospective, randomized study. J Gastroenterol Hepatol2012;27:504-9. Park HG, Jung MK, Jung JT, Kwon JG, Kim EY, Seo HE, et al. Randomised clinical trial: comparative study of 10-day sequential therapy with 7-day standard triple therapy for Helicobacter pylori infection in naive patients. Aliment Pharmacol Ther2012;35:56-65. Chung JW, Jung YK, Kim YJ, Kwon KA, Kim JH, Lee JJ, et al. Ten-day sequential versus triple therapy for H. pylori eradication: a prospective, open-label, randomized trial. J Gastroenterol Hepatol2012;27:1675-80. Kalapothakos P, Liantiniotis G, Koulentis M, Koutoufaris G, Georgantas P, Rigas S. Ten days sequential treatment for Helicobacter pylori eradication in clinical practice in Greece. Gut2012;61(suppl 3):A444. Singh M, Way LG, Logasamy N, Chettiar R, Na CS, Menon J. Helicobacter pylori eradication in East Malaysia: sequentail vs standard 7 day triple therapy—a prospective randomized trial. Gut2012;61(suppl 3):A212. Qian J, Ye F, Zhang J, Yang YM, Tu HM, Jiang Q, et al. Levofloxacin-containing triple and sequential therapy or standard sequential therapy as the first line treatment for Helicobacter pylori eradication in China. Helicobacter2012;17:478-85. Lahbabi M, Alaoui S, El Rhazi K, El Abkari M, Nejjari C, Amarti A, et al. Sequential therapy versus standard triple-drug therapy for Helicobacter pylori infection: result of the HPFEZ randomised study. Clin Res Hepatol Gastroenterol2012; published online 15 Nov.
Harmandar FA, Ustundag Y, Buyukuysal C, Ilikhan S, Gun Dogan B. The efficacy of clarithromycin based sequential therapy in eradication of Helicobacter pylori in Turkey. Gut2012;61(suppl 3):A443. Liou JM, Chen CC, Chen MJ, Chen CC, Chang CY, Fang YJ, et al. Sequential versus triple therapy for the first-line treatment of Helicobacter pylori: a multicentre, open-label, randomized trial. Lancet2012;6736:61579-87. Javid G, Zargar SA, Bhat K, Khan BA, Yatoo GN, Gulzar GM, et al. Efficacy and safety of sequential therapy versus standard triple therapy in Helicobacter pylori eradication in Kashmir India: a randomized comparative trial. Indian J Gastroenterol2013;32:190-4. Seddik H, Ahid S, El AT, El Hamdi FZ, Hassar M, Abouqal R, et al. Sequential therapy versus standard triple-drug therapy for Helicobacter pylori eradication: a prospective randomized study. Eur J Clin Pharmacol2013; published online 22 May. Yep-Gamarra V, Rodriguez-Ulloa C, Diaz-Velez C, Aldave-Herrera A, Donet JA, Rodas JI, et al. sequential versus triple standard therapy for Helicobacter pylori eradication. Gastroenterology2013;144(suppl 1):S333. Sardarian H, Fakheri H, Hosseini V, Taghvaei T, Maleki I, Mokhtare M. Comparison of hybrid and sequential therapies for Helicobacter pylori eradication in Iran: a prospective randomized trial. Helicobacter2013;18:129-34. McNicholl AG, Marin AC, Molina-Infante J, Castro M, Barrio J, Ducons J, et al. Randomised clinical trial comparing sequential and concomitant therapies for Helicobacter pylori eradication in routine clinical practice. Gut2013; published online 11 May. Liu SHK, Seto WK, Hung IF, Leung WK. 10-day sequential versus 10-day bismuth-containing quadruple therapy as empirical first-line treatment for Helicobacter pylori: an open label randomized crossover trial. Gastroenterology2013;144(suppl 1):S54. Ang TL, Fock KM, Ang D. A randomized controlled trial of triple therapy versus sequential therapy versus concomitant therapy as first line treatment for H. pylori Infection. Gastroenterology2013;144(suppl 1):S53. Zullo A, Scaccianoce G, De Francesco V, Ruggiero V, D’Ambrosio P, Castorani L, et al. Concomitant, sequential, and hybrid therapy for H. pylori eradication: a pilot study. Clin Res Hepatol Gastroenterol2013; published online 5 June. De Martel C, Ferlay J, Franceschi S, Vignat J, Bray F, Forman D, et al. Global burden of cancers attributable to infections in 2008: a review and synthetic analysis. Lancet Oncol2012;13:607-15. Malfertheiner P, Megraud F, O’Morain C, Bell D, Bianchi PG, Deltenre M, et al. Current European concepts in the management of Helicobacter pylori infection—the Maastricht consensus report. Eur J Gastroenterol Hepatol1997;9:1-2. Malfertheiner P, Bazzoli F, Delchier JC, Celinski K, Giguere M, Riviere M, et al. Helicobacter pylori eradication with a capsule containing bismuth subcitrate potassium, metronidazole, and tetracycline given with omeprazole versus clarithromycin-based triple therapy: a randomised, open-label, non-inferiority, phase 3 trial. Lancet2011;377:905-13. Gisbert JP. Sequential or concomitant therapy for Helicobacter pylori eradication? J Clin Gastroenterol2010;44:313-25. Megraud F, O’Morain CA, Malfertheiner P, Axon AT, Hunt RH. Guidelines for clinical trials in Helicobacter pylori infection. Gut1997;41(suppl 2):S1-9. Graham DY, Fischbach L. Helicobacter pylori treatment in the era of increasing antibiotic resistance. Gut2010;59:1143-53. Graham DY, Lu H, Yamaoka Y. A report card to grade Helicobacter pylori therapy. Helicobacter2007;12:275-8. European Study Group on Antibiotic Susceptibility of Helicobacter pylori. Results of a multicentre European survey in 1991 of metronidazole resistance in Helicobacter pylori. Eur J Clin Microbiol Infect Dis1992;11:777-81. Glupczynski Y, Megraud F, Lopez-Brea M, Andersen LP. European multicentre survey of in vitro antimicrobial resistance in Helicobacter pylori. Eur J Clin Microbiol Infect Dis2001;20:820-3. Zullo A, Rinaldi V, Winn S, Meddi P, Lionetti R, Hassan C, et al. A new highly effective short-term therapy schedule for Helicobacter pylori eradication. Aliment Pharmacol Ther2000;14:715-8. 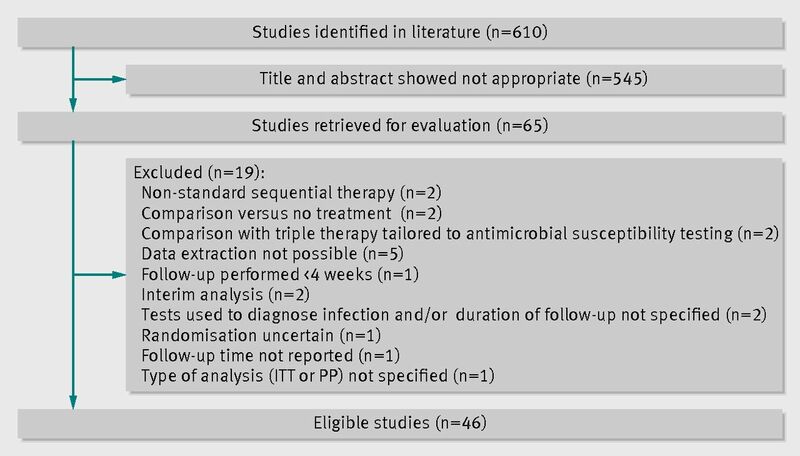 Gatta L, Vakil N, Leandro G, Di Mario F, Vaira D. Sequential therapy or triple therapy for Helicobacter pylori infection: systematic review and meta-analysis of randomized controlled trials in adults and children. Am J Gastroenterol2009;104:3069-79. Jafri NS, Hornung CA, Howden CW. Meta-analysis: sequential therapy appears superior to standard therapy for Helicobacter pylori infection in patients naive to treatment. Ann Intern Med2008;148:923-31. Federico A, Nardone G, Gravina AG, Iovene MR, Miranda A, Compare D, et al. Efficacy of 5-day levofloxacin-containing concomitant therapy in eradication of Helicobacter pylori infection. Gastroenterology2012;143:55-61. Luther J, Higgins PD, Schoenfeld PS, Moayyedi P, Vakil N, Chey WD. Empiric quadruple vs. triple therapy for primary treatment of Helicobacter pylori infection: systematic review and meta-analysis of efficacy and tolerability. Am J Gastroenterol2010;105:65-73. Gisbert JP, Calvet X. Update on non-bismuth quadruple (concomitant) therapy for eradication of Helicobacter pylori. Clin Exp Gastroenterol2012;5:23-34. Graham DY, Lee YC, Wu MS. Rational Helicobacter pylori therapy: evidence based medicine rather than medicine based evidence. Clin Gastroenterol Hepatol2013; published online 7 June. Duck WM, Sobel J, Pruckler JM, Song Q, Swerdlow D, Friedman C, et al. Antimicrobial resistance incidence and risk factors among Helicobacter pylori-infected persons, United States. Emerg Infect Dis2004;10:1088-94. Gatta L, Vakil N, Vaira D. Treatment of Helicobacter pylori in Latin America. Lancet2012;379:407-8. Schulz KF, Chalmers I, Hayes RJ, Altman DG. Empirical evidence of bias: dimensions of methodological quality associated with estimates of treatment effects in controlled trials. JAMA1995;273:408-12. Schulz KF, Chalmers I, Altman DG. The landscape and lexicon of blinding in randomized trials. Ann Intern Med2002;136:254-9. Conventional therapy vs sequential therapy in treatment of Helicobacter pylori infection. http://clinicaltrials.gov/ct2/show/NCT01723059.